Like everyone else in Bangalore, I love to talk about Traffic. My belief is that without traffic Bangalore will be a city where no body can carry a conversation for more than 5 seconds. Fortunately for the well being of so many Bangaloreans, I do not know to drive but employ a driver. His name is Bangarappa. He is seriously thinking of changing his name. It is not to appease the gods of luck with numerology. It is to salvage his pride after Bangarappa lost his election to Yeddyurappa. If I could change my name, I would like to change it to Brad Pitt / Gregory Peck to match with the way I would want to look. I can also change it Shahrukh Khan to match with the 6 packs which I am planning to get by my next life. My driver is extremely technology conscious. He can change his ring tone every other day while my wife cannot. It is also because he has a better mobile phone. The other reason I say that Bangarappa is on cutting edge of technology is because he is a Nano Technology researcher in disguise. He believes that he can squeeze an 1100 cc sedan in to space less than few millimeters including legs of cattle which passes our way. He also shares the following beliefs that all the motorists in Bangalore have. Optional is some thing all of us learn as students. All my course mates including me used to study only 50% of the syllabus. We did more important things like appreciating the art of movies for rest of the time. At a campus where we were doing interviews, one of the students was asked - Please tell the sequency for memory access in a computer. The student answered confidently "But sir, I left it as option during my exams". All of us nodded sympathetically and would have promptly hired him except that this student had left every thing out as optional. As a very compliant employer, there are very few rules set by me for Bangarappa. He cannot honk unless it is national emergency like the Indo Pak cricket match will get over by the time we reach home. The other one is that he cannot use his mobile phone while driving. It is good that at least some of the other fellow motorists also follow the rule. They use a hand free while attending to phone calls while driving. They get used to it so much that they use it even they are sleeping. The other day I saw a guy who made to the toilet with his hands free blinking from the ear and then the phone rang. He went about doing the business while on the hand free; he exclaims “What boss, long time, no see". 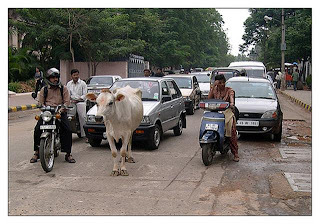 So folks, overtake a cattle head at your own peril, for Bangarappa could be driving underneath. BTW, I like Bangalore Traffic, since I don't need to have video game to have fun. I hunk as many time as I wish and love that. If the rule is broken I follow it. Thanks for "following" the blog. Finding a new wife is based on the inclination. We also have traffic stoppers in Bangalore. It is the huge cut outs of various actors and politicians which stops you through sheer surprise element. First time here, and man am I impressed. Hilarious, enjoyed it thoroughly. As they say a careful driver is one who honks his horn when he goes through a red light. i have made many friends travelling on the same route...every morning.Infact we often dread going early or late even by 5 minds...the roads are filled with strangers that day..
good article. :) yes, traffic police has to start 24hrs. watch on traffic movement to catch hold of all motorists driving wrongly. Leading software testing and test management service providers bangalore - india.